SK Telecom seems to speed up its internationalization process, more than doubling its subscriber base in Vietnam within one year to reach the 1M mark and targeting 4M by the end of 2008, which would at last sound like a significant position overseas. But investors tend to be more impressed by less spectacular moves on more demanding markets and Helio doesn't seem to claim many customers in the US. Yet, SKT's UI, T-PAK, is coming up on some Motorola handsets soon. And NATE just locked interesting deals on mobile search engines with Google, and on telematics and in-car entertainment with GM Daewoo cars (TTM 2008) : telematics through NATE Drive, movies through Cizle, music through MelOn... Korea's leading cellco is eventually leveraging on its Jeju Telematics trials*. Airwaves do cross the seas, but the other way : W-CDMA / HSDPA were already gaining momentum thanks to SKT and KTF, and now LG Telecom announces GSM-enabled phones by the end of the year. Of course, LGT will invest KRW 400 bn in EV-DO rA over 3 years (including 170 BS in Seoul), but only 15 will be spent by the end of 2006 instead of the 40 planned earlier. ** Neupara from Columbia, MD (neupara.com), chose POSDATA for its 2.3GHz WiBro trial in the US. Posco's subsidiary joins Samsung in the US market and Neupara keeps pushing Korean technologies after T-DMB in India. Its CEO, Mr John J. Shin, happens to be a Korean-American. In the latest Orange - Microsoft deal, France Telecom's DNA prevailed over Hans Snook's. France Telecom the incumbent and former monopoly, not France Telecom, the brilliant innovator and solutions provider, father of the CNET (now France Telecom R&D). Competitors can worry now that two major predators team up in the convergence arena. They're meaning business, market share and furthermore, share of client. Bouygues Telecom remains a Microsoft partner, but with a less exciting revenue sharing deal and a smaller pie to share. And don't count on i-mode for a long lasting differenciation. Convergence ? Sorry lads, rival SFR keeps an eye on your pal Neuf cegetel (as a strong minority shareholder and a friendly M-VNO host for Neuf Mobile) while building an ADSL offer on the ashes of Tele2 France. "Mobile Centric" SFR also promotes its own SFR Messenger and a teletubby-sounding Happy Zone. Cute, but will this stop pervasive MSN and ubiquitous unik ? In a cross continental move, Vivendi is building a telecommunity MVNO on SFR's network through another subsidiary, Maroc Telecom. MobiSud* will naturally serve France's strong Moroccan community as a start, but Telefonica should expect quite a few skirmishes accross the Mediterranean ring. * dot fr or dot com ? Both have recently been locked, the latter by the adco JumpFrance. DoCoMo will soon expand its HSDPA coverage beyond Tokyo in Japan's major cities. 33,000 FOMA HIGH-SPEED handsets were sold during the first month of operation last summer and the MOVA / FOMA ratio fell from 54% to 45% between end of March and end of August 2006. NTT DoCoMo's overall marketshare keeps going down too, but at a much slower pace (not even one point over the last two years). Churn rate even flirted with the 0.60% line lately. But MNP should boost it back up to 0.85%. And Softbank Mobile starts releasing impressive series of 3G W-CDMA handsets. i-mode still suffers at the global level and e-Wallet / m-payment services seem to be the only promising driver right now : end of August, DCMX claimed 800,000 users (the service was launched in April) and Felica almost one third of DoC's 47.1M customers (15.5M enabled handsets). Besides, iD will share a common platform (PoS reader / writer, data center) with JR East's Suica next January and others will follow soon afterwards (JCB Co.'s QUICPay and bitWallet Inc.'s Edy). But nothing really new under the sun : JR East and DoCoMo have been working on it for over a year*. Well... "DoCoMo Vision 2010" is getting older and it starts showing. Multimedia and Ubiquity didn't bring any major disruption, and Globalization looks gloomy. In Europe at least. Teaming up with KTF was the smartest move in the past few years. Wibree is not the offspring of WiBro and Brew but Nokia's latest attempt to federate the industry in the near field communication arena (oh, by the way... the NFC Forum recently delivered their yearly press release : the relevantly named SmartPoster could help them post 4 specs within a 12 month span). Wibree's logo is a maritime and bluetoothish version of the golden goose : a four legged orange sea star laying blue eggs around. As a matter of fact, "Wibree technology complements close range communication with Bluetooth like performance within 0-10 m range and data rate of 1 Mbps. Wibree is optimized for applications requiring extremely low power consumption, small size and low cost". Beyond catching Dubya's brainwaves, this should include (according to the user cases proposed by Noknok's marketing geniuses) such applications as sports and health monitoring, entertainment management and ergonomics at work. I'm not sure dual mode Bluetooth-Wibree chips will reach the $5 retail price initially announced for stand-alone Bluetooth, but the Viking must welcome this newcomer on board. The crew includes Broadcom Corporation, CSR, Epson and Nordic Semiconductor (licensing), Suunto and Taiyo Yuden (interoperability). Let your customers do the job. When you're nothing but an empty shell, where can you get substance for a better price ? Google Earth was a really smart move to aggregate content and value but it takes time to build a virtual world... so why not ask your visitors to build their ownhomes ? See SK Telecom : an army of minimes designing their own environments and even paying for the virtual stuff they add (show me the acorns : cyworld's totoris) ! 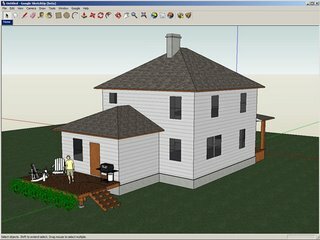 Google may not end up hammering down competitors with YouTube, they keep giving their users potentially dangerous tools and Google SketchUp, an easy-to-learn 3D modeling program, could turn as addictive as Earth or even Hell. For those who tend to plan ahead at least. Probably not the kill app for the masses, but one for a rather interesting target for announcers.